Students who remain continuously enrolled (summer term excluded) are approved for registration each semester or term as long as they maintain the required academic standards. 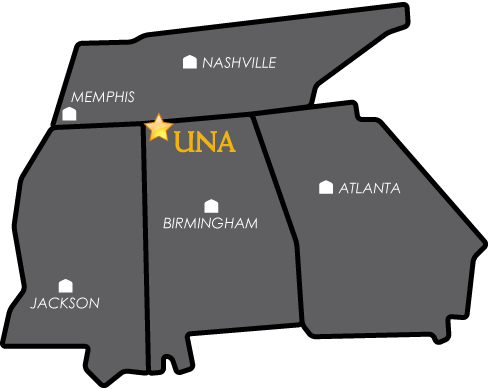 UNA students who wish to reenroll after an absence of one or more fall or spring semesters must apply for readmission as former students. Summer terms have no effect on this category. Complete the UNDERGRADUATE ADMISSION APPLICATION. The $35 application fee is not required for former students. Students who apply for readmission are subject to all published application deadlines. Former students who apply for readmission after attending other institutions will be evaluated as transfer students and must meet the transfer student admission requirements. Transcripts must be requested from other institutions and will be evaluated and considered as a part of the readmission process. This policy also applies to students who attend other institutions during the summer term. Students may avoid this process by getting advance approval to take courses elsewhere as transient students.